Through Dr. Ellen Burts-Cooper’s work and experience with clients from a wide variety of industries she began to notice a common theme that connected all of our work, the need for teams to work together more cohesively for any of the other work we do with processes and strategic planning to be successful. Late one night in the fall of 2012, Ellen realized what she needed to do. She envisioned a maze of challenges that teams must navigate through to improve, something that encouraged team building as something that is done each day, not just once a year. The next day, during a road trip with her husband, Ellen told him about her idea, saying “wouldn’t that be amazing?” The only problem was she didn’t know what to call it. He turned to her and as if it was the most obvious thing in the world said, “aMAZEing Teams.” Thus, the aMAZEing Team Building Experience was born. Over the next nine months, Ellen worked to bring together a team of select individuals with two very distinct thought processes: an engineer with an MEM degree and an Organizational Development professional with an MPOD degree, both from Case Western Reserve University. Despite the obvious differences, these two thought processes came together in an incredible display of mental ability to make her vision a reality. 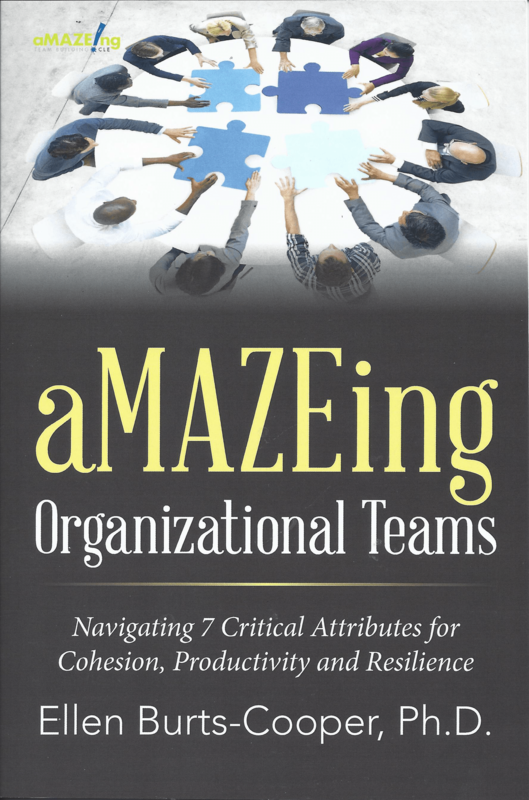 aMAZEing Team Building will coach teams (up to 10) through a maze of challenges where they must demonstrate seven critical team attributes. These attributes are: Trust, Appreciation, Communication, Creativity & Ideation, Meeting Management, Behavior Management and Problem Solving & Decision Making. This fun, interactive experience will help teams become more collaborative and resilient, leading to increased productivity and a more cohesive work culture. Why are the attributes important? Trust promotes transparent relationships that lead to highly functioning teams. Teams build confidence, cohesive relationships and reliance. Appreciation increases productivity and promotes accountability. Teams build trust and accountability. Communication conveys direction within the organization. It creates an inclusive environment. Teams build respect for others, connectedness and awareness. Creativity & Ideation increases return on creativity supporting both innovation and problem solving. Teams build innovation, risk and empowerment. Meeting Management creates a disciplined approach to managing the process of communication within a group setting that leads to the desired results within the organization. Teams build democracy & inclusion, organizational effectiveness and efficiency. Behavior Management generates performance that establishes credibility, and manages and motivates others to achieve performance goals. Teams build self-control, empathy, social awareness and cooperation. Problem Solving & Decision Making creates new solutions and new ways to work which leads to increased productivity. Teams build critical thinking, adaptability and introspection. We believe that a maze is an intricate, sometimes mystifying, network of interconnecting pathways that lead to freedom of confinement. At aMAZEing Team Building, we think of team building as something that must be done daily. We believe that teamwork is not build by “retreating” as a group for a couple of days each year. To truly create effective and productive teams, certain skills and attributes must be learned, practiced and continuously developed. We would love to give you a tour! Contact us at (216) 539-8737 to schedule a tour today.